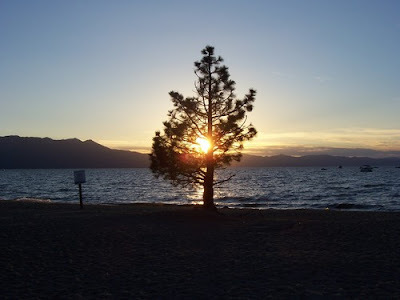 As I am preparing to leave with my kids on our trip to Lake Tahoe this morning I want to share some things I've missed in the 7 years since I've been there. 1. 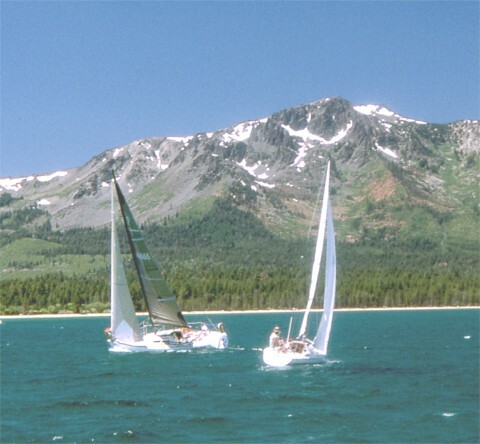 The awe - the Tahoe basin was formed about 2 million years ago. Two million years. And it's just so gorgeous! When we're driving up Spooner Summit from Reno and a little triangle of the Lake appears, it never fails to take my breath away. In my personal opinion, it is the definition of "God's country". 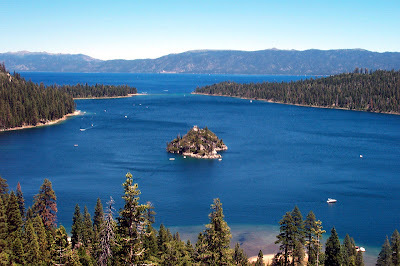 This is Emerald Bay, just one little corner of the Lake. 2. 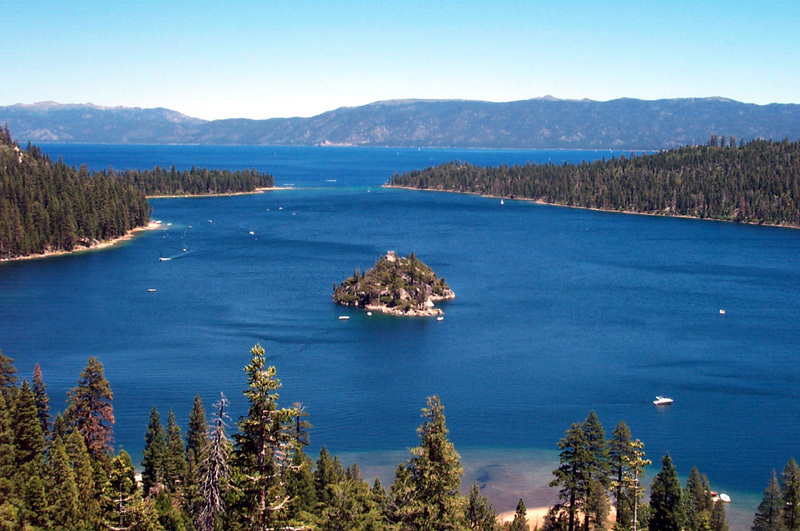 The size - Lake Tahoe is the largest alpine lake in North America. 3. The color of the water - several shades of blue, my favorite color, and some green. 5. Being up above it all - perched at 6,225 feet above sea level. 6. Dining next to the Lake at sunset. 7. Mt. Tallac - I've climbed this mountain. Didn't I say something about God's country? 9. My Grama whom I haven't seen in the last 7 years and who hasn't met my son. 10. My best friend JHo, her husband and kids who I haven't seen since AJ's Baptism 5 years ago and whose son I haven't met, even though JHo named me a Godmother to him. I am SO EXCITED for this trip! My mother is beyond generous for buying our plane tickets. I was am very anxious about going without Mark and leaving him home alone. I worry so much about him having a medical emergency. But my theme for this year of my life seems to be all about being open, and working on letting go of my fears. "Working on" are the key words there. This is breathtaking. Have a lovely trio Jen. Every single moment of it! Those pictures are incredible. I wanna go! I'm sure it was just an oversight you didn't invite me. I know you really want me there, which is why I'm hopping on a plane right now. See you in a few! This post makes me want to go there! I've never been and it looks beautiful :) Thank you so much for sharing this with us! I've never been to Tahoe, but those photos are absolutely breathtaking. Those shades of blue & green, fabulous! Beautiful Tahoe, beautiful photos. I am from Marin so I would go up there a lot. I loved this post and am excited for your trip. (-: I am sure your grama will be happy to see you after 7 years! Beautiful pictures! 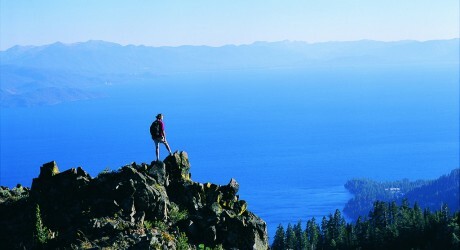 I've never been to Tahoe and have always wanted to go. Will keep Mark in my thoughts and prayers for safety and health while you're gone! This is a place definitely on my bucket list to visit one day! Gorgeous photos! I pray you have a blessed trip and all will be well back home. have fun! Simply wonderful! It's been over 10 years since I've been there and I still dream of going back. Have a wonderful trip!! Those are really beautiful pictures. It's making me long for a holiday myself!